This month I felt I lost my way slightly with my Instagram photos at one point and I wasn't quite as pleased with them as I was in June. However I've pulled it back again towards the end of the month and I'm pleased to see I'm still gaining around 100 new followers a month. I kind of set myself an unofficial target to try and hit 1000 followers by the end of the year and I'm well on the way to smashing through that target if I keep going as I am. I'm really pleased I've managed to improve so much considering I only gained 112 followers through the whole of 2015. T:L This was the month that I spotted Soap & Glory were releasing some new blushes and I instantly fell in love with the look of them. I originally wanted all three shades but when I headed down to my local Boots I decided just one would do and Cheeky Pink came home with me. 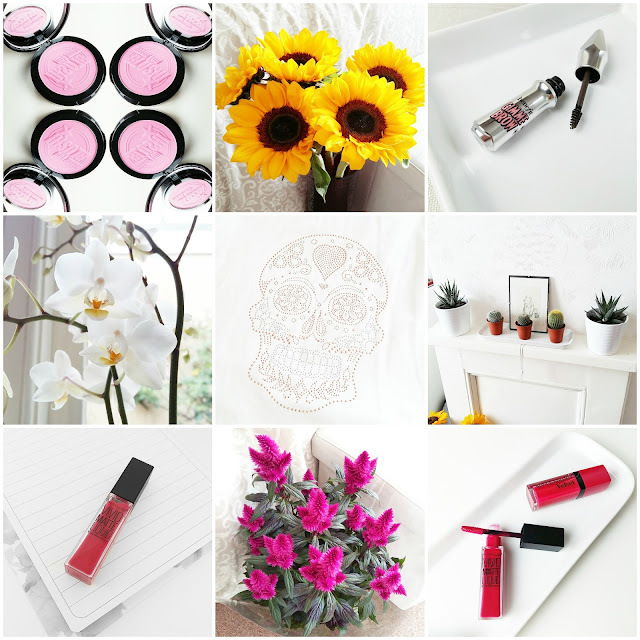 T:M There's several flower/plant based favourites this month. One night in July my boyfriend turned up on my doorstep with some beautiful sunflowers for me. I've always been a fan of sunflowers and can never get over just how massive their flowers are. T:R I never do anything with my brows apart from pluck them but I recently picked up a couple of magazine samples of two of Benefit's new brow products; Gimme Brow and Ready, Set, Brow! I've only tried Gimme Brow so far but I'm really impressed. M:L One day my housemate found an abandoned delivery by his car. It was soaking wet because it was raining and had no address on it. I put it in the house to keep dry and after not being able to find anybody on the street who was expecting it I kept it. Inside was a beautiful M&S orchid (worth about £40!). M:M Back at the end of 2015 I won a £100 River Island card. Although I have bought a skirt with it I've been struggling to spend the rest. Last week I popped in and a T shirt caught my eye. It's just a simple plain white loose T but the combination of diamante's and a sugar skull was a winner for me. M:R My new house is a terrace, so it's quite small already, and unfortunately each room has a blocked off fireplace taking up space I'd prefer to have use of. I decided to try and make the best of it in my room by making a little cacti/succulent display and I'm really pleased with it. B:L I wasn't intending to pick up any of the new Maybelline liquid lipsticks, but after swatching a few out of curiosity I really liked the look of Berry Boost. I like the colour and how easy it is to apply but I'm disappointed it doesn't dry down considering it is called a matte product. B:R Last Friday was National Lipstick Day and as my current favourite type of lip product is a liquid lipstick I posted a picture of a couple. My current favourite is the Bourjois Rouge Edition Velvet's, although I haven't tried many at all. Last month I didn't recommend any accounts to follow because I did two months in one, so it was quite a long post. This month I thought I'd treat you to some sweet treat accounts. For all sorts of baking and desserts you need @bakingamoment, for amazingly decorated biscuits you need @hol_fox and for pretty and pastel edible treats galore you need @sweetbakeshop. Are there any Instagram accounts you think I should be following?